Revenues are delivered to the charity Sterntaler eV without any shortage. 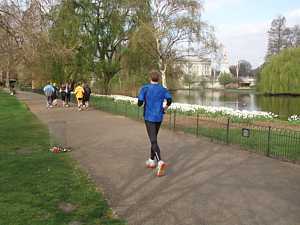 Year after year the London Marathon organisers claim to have engaged the best field of elite runners ever. However, this time the efforts were somewhat ill-fated. There were contracts fixed with both the world record holders, but both had to withdraw due to injury. 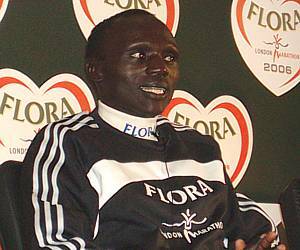 First it was Paula Radcliffe who suffered from a bruised toe since December, and a few days before the race Paul Tergat had to call his start off after he caught a sudden problem with his calf muscle. What are the organizers now going to do with the saved money? Anyway, the elite field is just the very smallest part of the mass event which turns London into a traffic free Sunday city. 1981, seeing the marathon debut, there were 20.000 athletes applying for 7.747 numbers. 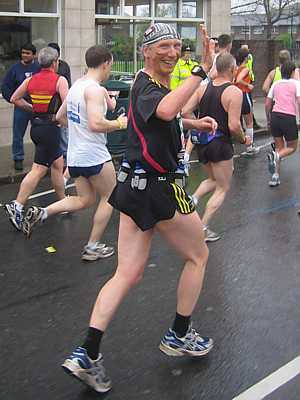 For the 25th marathon edition in 2005 there were 131.000 runners trying to get in, with 47.969 lucky to receive a place. This year numbers were limited to 46.926 after race director David Bedford got the impression the route had reached its capacity. The BBC got it right, advertising their TV live coverage by showing a chicken and an egg, underlined "It doesn't matter who comes first." This, too, was the motto of most of the runners. 70% were fundraising for their chosen charity. Many of them wore colourful and imaginative costumes, sometimes spacious ones. £35 mio are expected to be collected. 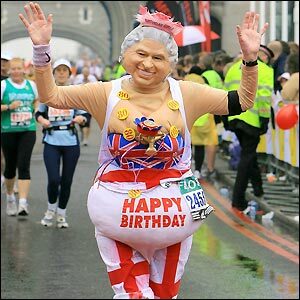 The London Marathon never lacked self-confidence. 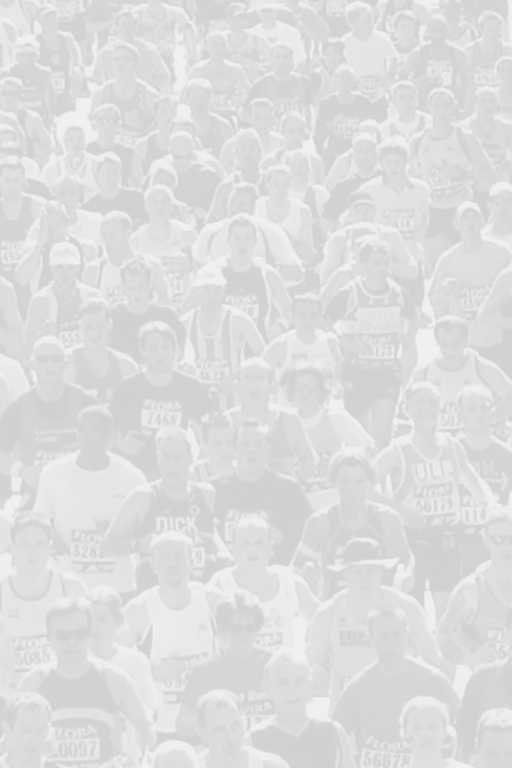 "The world's best marathon" they call themselves, like never heard of British understatement. Regarding the atmosphere along the route and the mood of runners and spectators alike, the judgement is undoubtedly right. 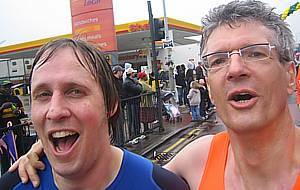 However, if the London Marathon wants to play the leading role within the newly founded World Marathon Majors there are of lot things to improve looking at the technical service for the mass runners. The process to enter the race is still at the same technical development status as it was in 1981. It is so long winded and circumstantially that a brochure is sold for £9 to enable applicants to understand the process. Comparing with Berlin, Chicago, New York, runners miss the online-entry, online list of accepted applications, certificate, short message service, online trekking en route, results sent via mail. London has the biggest budget and the smallest service. Wonder why we come again year after year? It's the time between the start and the finish which is simply unrivalled. My own preparations were not very lucky either. Running in the wintry woods I caught an ankle injury which I didn't allow to be cured properly. Finally I was down to an emergency training programme of not more than 20 miles per week. I could only run the marathon by taking diclofenac tablets which are not banned but certainly this is not the model how a recreational runner should act. 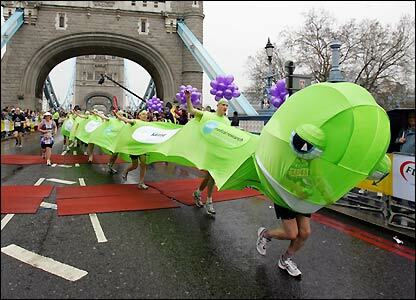 I would have withdrawn from any other marathon, but My London? The Daily Telegraph called it "The annual masochist fest". This couldn't take place without me. A size check of the fat depot at my hips didn't prove being ready for the best of my performances. I hadn't get close to the scales for weeks. Who dares to see the truth? Lloyd Scott alias St. Georg was fundraising for Leukaemia research. 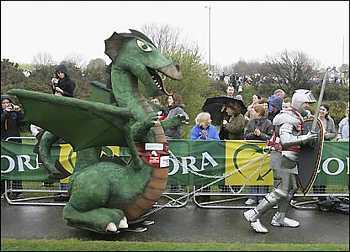 His armous has 100lbs, and the dragon lacks wheels because the rules of the London Marathon strictly ban all wheeled vehicles. Lloyd planned to reach the finish line the following sunday. Daily Telegraph: "A mixture of pleasure and pain." What I have developed: Pain is pure pleasure. When I glared at the men's top runners on the other side of The Highway - they were 9 miles in front of me - the women's elite field was gone through long before. The ladies had started 45 minutes before us. 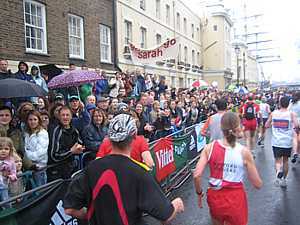 Top-seeded Deena Kastor (USA), lastly second place in Berlin's big Half Marahton clocking a US record, ran a lonesome race around the Isle of Dogs and along the Embankment heading to Buckingham Palace. Even so she was not free of doubts. Chicago was in her minds where she faced a breakdown in the final stages managing to win by her very last energy. Quoting Deena: The 20-mile point is always the gauge of whether it's going to be a good or a bad day and at that stage I felt very comfortable. But the marathon can be very deceptive. You want to stay in control for as long as possible but the monkey can jump on your back at any time." I didn't know that there are monkeys on US marathon routes. It was nearly the same with me. After 20 miles I didn't feel safe. "If I had to walk the rest of the distance, it would take me 2 hours to get to the finish. I will certainly get my medal." were my thoughts. But I managed to keep running and to hold the pace. Deena Kastor did it the perfect way, clocking two identical half marathons and finishing after 2:19:36, a US record what made her the 4th fastest women ever. Even before she crossed the finish line race directors of New York and Chicago Marathon started negotiating about her start in their event. Rennen zu verpflichten. 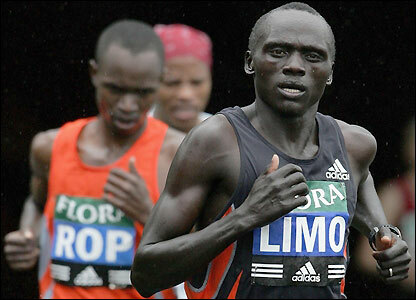 May be one of them will host the showdown with Deena Kastor and Paula Radcliffe. The above mentioned monkey meanwhile was sitting on the back of Haile Gebrselassie. "At 25K I knew that my race was over. It was surprising that I managed to reach the finish." He defencelessly had to watch the Kenians making their way for victory and blamed the wet and cold London weather on his muscle problems. to the media. 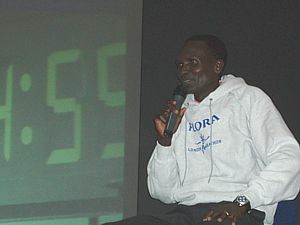 Felix already won the fast marathons in Rotterdam (PB 2:06:14), Berlin and Chicago. Therefore he currently is the world's most successful marathon runner. 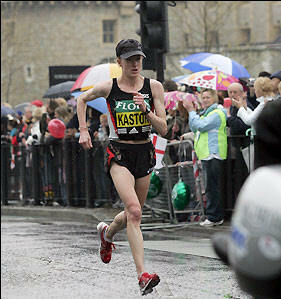 His race comment was: "I knew at the 40K mark that I was going to win or come very close. I felt good although the conditions were not great. But when the conditions are not perfect you have to use your brain as well as your legs." Deena Kastor making her way to victory. Felix Limos impish answer after being asked what he will be doing with his prize money: "I havn't got any money yet." The winner in front of the press, Race Director David Bedford on the right.